This is probably a kind of obscure topic but I found it interesting so I'm writing it up. It is not something I recommend you actually do. Rather, I think working through the topic will help illustrate some things about making 3d models for WebGL. 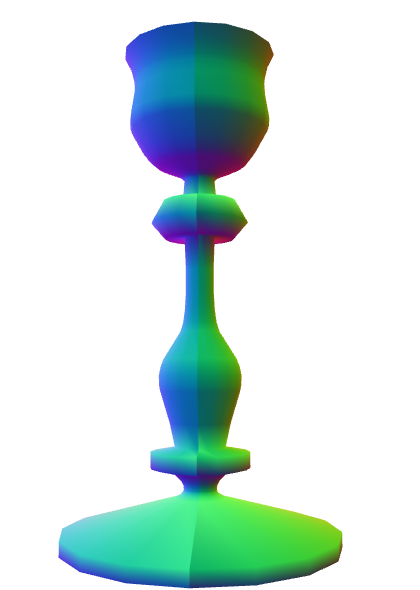 Someone asked how to make a bowling pin shape in WebGL. The smart answer is "Use a 3D modeling package like Blender, Maya, 3D Studio Max, Cinema 4D, etc. Use it to model a bowling pin, export, read the dat. (The OBJ format is relativly simple). But, that got me thinking, what if they wanted to make a modeling package? There's a few ideas. One is to make a cylinder and try to pinch it in the right places using sin waves applied in certain places. The problem with that idea you wouldn't get a smooth top. A standard cylinder is generated as a series of equally spaced rings but you'd need more rings where things are more curvy. In a modeling package you'd make a bowling pin by making a 2d silhouette or rather a curved line that matches the edge of a 2d silhouette. You'd then lathe that into a 3d shape. By lathe I mean you'd spin it around some axis and generate points as you do. This lets you easily make any round objects like a bowl, a glass, a baseball bat, bottles, light bulbs, etc. So, how do we do that? Well first we need some way to make a curve. Then we'd need to compute points on that curve. We'd then rotate those points around some axis using matrix math and build triangles from those points. The most common kind of curve in computer graphics seems to be a bezier curve. If you've ever edited a curve in Adobe Illustrator or Inkscape or Affinity Designer or similar programs that's a bezier curve. A bezier curve or rather a cubic bezier curve is formed by 4 points. 2 points are the end points. 2 points are the "control points". We pick a number between 0 and 1 (called t) where 0 = the beginning and 1 = the end. We then compute the corresponding t point between each pair of points. P1 P2, P2 P3, P3 P4. In other words if t = .25 then we compute a point 25% of the way going from P1 to P2, another 25% of the way going from P2 to P3 and one more 25% of the way going from P3 to P4. You can drag the slider to adjust t and you can also move points P1, P2, P3, and P4. We do the same for the resuling points. Compute t points between Q1 Q2 and Q2 Q3. Finally we do the same for those 2 points and compute the t point between R1 R2. The positions of that red point make a curve. So this is a cubic bezier curve. Where P1, P2, P3, P4 are the points like the examples above and P is the red dot. In a 2D vector art program like Adobe Illustrator when you make a longer curve it's actually made from many small 4 point curves like this. By default most apps lock the control points around a shared start/end point and make sure they are always opposite relative to the shared point. See this example, move P3 or P5 and the code will move the other. Notice the curve made by P1,P2,P3,P4 is a separate curve from the one made by P4,P5,P6,P7. It's just when P3 and P5 are on exact opposite sides of P4 together they look like one continuous curve. Most apps will then usually give you the option to stop locking them together so you can get a sharp corner. Uncheck the lock checkbox then drag P3 or P5 and it will become even more clear they are separate curves. Next up we need a way to generate points on a curve. Using the formula above we can generate a point for a given t value like this. In the diagram above you can choose a number of points. If the curve is sharp you'd want more points. If the curve is nearly a straight line though you'd probably want less points. One solution is to check how curvy a curve is. If it's too curvy then split it into 2 curves. The splitting part turns out to be easy. 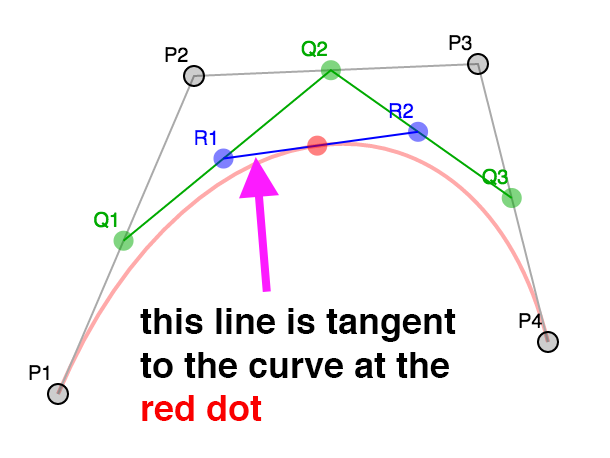 If we look at the various levels of interpolation again, the points P1, Q1, R1, RED make one curve and the points RED, R2, Q3, P4 make the other for any value of t. In other words we can split the curve anywhere and get 2 curves that match the original. The second part is deciding if a curve needs to be split or not. Looking around the net I found this function that for a given curve decides how flat it is. We can use that in our function that gets points for a curve. First we'll check if the cuvry is too curvy. If so we'll subdivide, if not we'll add the points in. This algorithm does a good job of making sure we have enough points but it doesn't do such a great job of getting rid of unneeded points. For that we turn to the Ramer Douglas Peucker algorithm I found on the net. In that algorithm we take a list of points. We find the furthest point from the line formed by the 2 end points. Then we check if that point is further away from the line than some distance. If it's less than than that distance we just keep the 2 end points and discard the rest Otherwise we run the algorithm again, once with the points from the start to the furthest point and again from the furthest point to the end point. v2.distanceToSegmentSq is a function that computes the distance squared from a point to a line segment. We use the distance squared because it's faster to compute than the actual distance. Since we only care which point is furthest the distance squared will work just as well as the actual distance. Here's that in action. Adjust the distance to see more points added or removed. Back to our bowling pin. We could try to extend the code above into a full editor. It would need to be able to add and remove points, lock and unlock control points. It would need undo, etc... But there's an easier way. We can just use any of the major editors mentioned above. I used this online editor. Here's the svg silhouette of a bowling pin I made. Interpreting that data we get these points. Now that we have the data for the curves we need to compute some points on them. We'd call simplifyPoints on the result. Now we need to spin them around. We decide how many divisions to make, for each division you use the matrix math to rotate the points around the Y axis. Once we've made all the points we connect them with triangles using indices. // rotates around Y axis. The code above generates positions and texcoords, it then generates indices to make triangles out of those. The capStart and capEnd specify whether or not generate cap points. Imagine we're making a can. These options would specify whether or not to close the ends. Play with the sliders to see how they effect the result. There's an issue though. Turn on triangles and you'll see the texture is not evenly applied. This is because we based the v texture coordinate on the index of the points on the line. If they were evenly spaced that might work. They're not though so we need to do something else. We can walk the points and compute the total length of the curve and each point's distance on that curve. We can then divide by the length and get a better value for v.
// rotates around Y access. Those texture coordinates are still not perfect. We haven't decided what to do for the caps. This is yet another reason why you should just use a modeling program. We could come up with different ideas about how to compute uv coordinates for the caps but they'd probably not be all that useful. If you google for UV map a barrel you'll see that getting perfect UV coordinates is not so much a math problem as a data entry problem and you need nice tools to enter that data. There's still one other thing we should do and that's add normals. We could compute a normal for each point on the curve. In fact if you go back to the examples on this page you can see the line formed by R1 and R2 are a line tangent to the curve. A normal is perpendicular to the tangent so it would be easy to use the tangents to genearate normals. There are many smooth areas but also many hard corners. How do we decide which normals to use? Worse, when we want a sharp edge we need extra vertices. Because vertices have both a position and a normal if we need a different normal for something at the same position then we need a different vertex. This is why if we're making a cube we actually need at least 24 vertices. Even though a cube only has 8 corners each face of the cube needs different normals at those corners. When generating a cube it's easy to just generate the correct normals but for a more complex shape there's no easy way to decide. All modeling programs have various options to generate normals. A common way is for every single vertex they average the normals of all the polygons that share that vertex. Except, they let the user choose some maximum angle. If the angle between one polygon shared by a vertex is greater than that maximum angle then they generate a new vertex. // Compute the normal for every face. // We need to figure out the shared vertices. //     \   /    as they don't share UV coords. In the code above first we genearte normals for each face (each triangle) from the original points. We then generate a set of vertex indices to find points that are the same. That's because as we rotated the points the first point and the last point should match up but they have differnet UV coordinates so they are not the same point. To compute the vertex normals we need them to be considered the same point. Once that's done, for each vertex, we make a list of all the faces it's used by. Finally we average the normals of all the faces each vertex uses excluding ones that are more than maxAngle different and genearte a new set of vertices. Notice we get sharp edges where we want them. Make the maxAngle bigger and you'll see those edges get smoothed out when the neighboring faces start getting included in the normal calculations. Also try adjusting the divisions to something like 5 or 6 then adjust the maxAngle until the edges around are hard but the parts you want smooth are still smooth. You can also set the mode to lit to see what the object would look like with lighting, the reason we needed normals. To do anything really useful you'd likely need a real UV editor. Dealing the the caps as well is something a 3D editor would help with. Instead of using a limited set of options when lathing you'd use other features of the editor to add caps and generate easier UVs for the caps. 3d editors also support extruding faces and extruding along a path which if you take a look it should be pretty obvious how they work based on the lathe example above. I wanted to mention I couldn't have done this without this awesome page about bezier curves. What's this modulo operator doing here? If you look closely at the lathePoints function you'll see this modulo when computing the angle. When we rotate the points all the way around a circle we really want the first and last points to match. Math.sin(0) and Math.sin(Math.PI * 2) should match but floating point math on a computer is not perfect and while they are close enough in general they are not actually 100% equal. That matters when we try to compute normals. We want to know all the faces a vertex uses. We compute that by comparing vertices. If 2 vertices are equal we assume they are the same vertex. Unfortunately, because Math.sin(0) and Math.sin(Math.PI * 2) are not equal they will not be considered the same vertex. That means when computing the normals they won't take into consideration all the faces and their normals will come out wrong. My first thought was that I should change my solution so that when I check for matching vertices I check if they are within some distance. If they are then they're the same vertex. Something like this. // was the closest vertex close enough? // yes, so just return that vertex's index. // no match, add the vertex as a new vertex and return its index. It worked! It got rid of the seam. Unfortunately it took several seconds to run and made the interface unusable. This is because it's a O^2 solution. If you slide the sliders for the most vertices you can generate ~20000 vertices. For an O^2 that's up to 300 million iterations that have to happen. I searched the net for a easy solution. I didn't find one. I thought about putting all the points in an octtree to make finding matching points faster but that seems like a way too much for this article. Because of the module the angle when endAngle is Math.PI * 2 becomes 0 and so it's the same as the start. The seam went away. Problem solved! Still, even with the change if you set distance to 0.001 and divisions to 60 it takes nearly a second on my machine to recompute the mesh. While there might be ways to optimize that I think the point is realizing that generating complex meshes is a generally slow operation. This just one example of why a 3d game can run at 60fps but a 3d modeling package often chugs at very slow frame rates. Is matrix math is overkill here? When we lathe the points there is this code to rotate with. Transforming an arbitrary 3d point by a 4x4 matrix requires 16 multiplies, 12 adds, and 3 divides. We could simplifiy by just using unit circle style rotation math. That's only 4 multiplies and 2 adds and no function call which is probably at least 6x faster. Which way is best is really up to you and your needs. I think I'd choose flexible first and only later optimize if something was too slow for whatever I was doing.